Calculate NEWS or NEWS2 scores during the assessment of acute illnesses in patients. ​Now also available on Android. A score is allocated to each parameter during measurement. A larger score means the parameter varies more from normal levels. NEWS2 Calculator has options to colour code the controls based on their value (for example, when changing the value of a parameter which would give a score of 3, the control turns red). The colours are based upon the NEWS2 chart which healthcare workers are already familiar with, making NEWS2 Calculator extremely intuitive and easy to use. 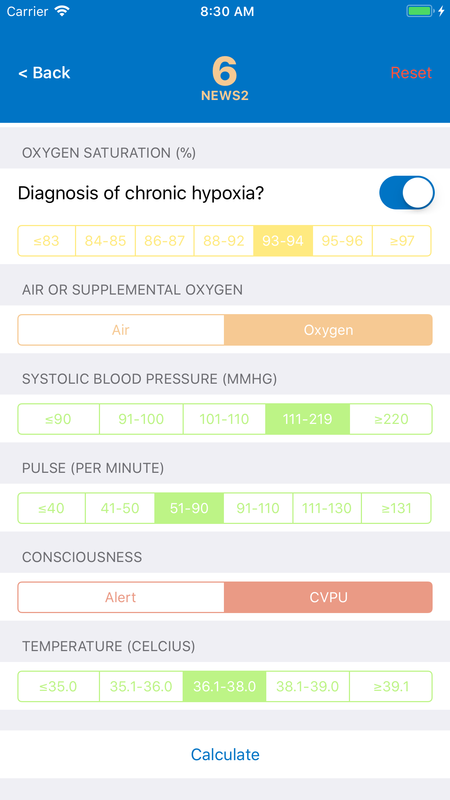 There is also an option for alerts to appear which provide further guidance for healthcare workers on the best course of action to take, based upon the NEWS or NEWS2 score which was calculated.